The squadron gained the nickname "105th Light Attack and Twilight Pursuit Squadron" during the Vietnam war. "Twilight Pursuit" was a tongue-in-cheek reference to the fact that squadron aircraft carried the air-air AIM-9 Sidewinder missile. The nickname became somewhat more formally accepted in the months leading up to the 1974-75 Mediterranean Cruise. Appearing on squadron patches proudly worn by officers and enlisted men alike, the nickname was heavily promoted by the squadron's pilots. Two distinct squadrons have been designated VA-105. The first VA-105 was established on 1 May 1952 and was stood down on 1 February 1959. The second was later re-designated as VFA-105 in 1967. Attack Squadron 105 (VA-105) was established on 1 November 1967 at NAS Cecil Field, flying the new A-7A Corsair II. On 4 March 1968 the squadron completed A-7A training under VFA 174 and became an operational Atlantic Fleet unit. The squadron embarked on their first deployment to Southeast Asia aboard USS Kitty Hawk, participating in combat operations in the Gulf of Tonkin from January to October 1969. Following the shooting down of a US Navy EC-121 by North Korea in April, Kitty Hawk deployed as part of the American naval presence maintained off the coast of Korea. In September and October 1970 following the hijacking of several airliners by Palestinian terrorists and the invasion of Jordan by Syria, USS Saratoga with VA-105 embarked commenced operations in the eastern Mediterranean. Tasked to support the evacuation of Americans from Jordan and to show support for the Jordanian government. From June–December 1972, the squadron participated in Operation Linebacker, heavy air strikes against targets in North Vietnam to interdict the flow of supplies into South Vietnam. In May 1973, the squadron upgraded to the A-7E. As of December 1979 the squadron had two Western Pacific and six Mediterranean deployments to their credit. In June 1982 following the Israeli invasion of Lebanon, VA-105 operated from USS John F Kennedy to support an evacuation of Americans. From July–December 1984, the squadron deployed to MCAS Iwakuni, assigned to MAG-12, 1st MAW. This was the first time a Navy squadron participated in the US Marine Corps unit deployment programme. (UDP) and the first Navy squadron since World War II to come under the command of a Marine Corps officer. While deployed with the Marines the squadron’s major mission tasking was that of Close Air Support. During the 1980s, the squadron completed eight overseas deployments, including six to the Mediterranean, and a 1983 around-the-world deployment aboard the USS Carl Vinson. VA-105 was re-designated Strike Fighter Squadron 105 (VFA-105) on 17 December 1990, as the squadron transitioned to the F/A-18C Hornet. The squadron reported to Carrier Airwing Three (CVW-3) aboard the USS John F. Kennedy on 1 September 1991. VFA-105 made their first Hornet cruise in October 1992. They returned from the Mediterranean in April 1993, and began workups for a deployment aboard the USS Dwight D Eisenhower in October 1994. The squadron then started workups for a deployment aboard the USS Theodore Roosevelt in October 1996. VFA-105 and the rest of CVW-3 deployed in 1998 in support of Operation Southern Watch and Operation Desert Fox onboard the USS Enterprise. On November 28, 2000 VFA-105 embarked on the maiden deployment of the USS Harry S Truman to the Mediterranean and Persian Gulf in support of Operation Southern Watch (OSW). 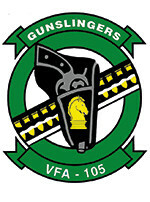 The Gunslingers deployed in support of Operation Iraqi Freedom aboard the USS Harry S Truman 2003, operating from the Mediterranean Sea. VFA-105 became the first East Coast squadron to transition to the F/A-18E Super Hornet in July 2006. In March 2007, VFA-105 became the first operational Navy strike fighter squadron to be commanded by a female when CDR Sara Joyner took command. In May 2010 VFA-105 embarked on a 7-month deployment onboard USS Harry S Truman and returned home on 20 December 2010. On July 22, 2013, VFA-105 deployed onboard USS Harry S Truman for a 9-month deployment in support of Operation Enduring Freedom. In January 2014 two squadron F/A-18Es were deployed on board the French aircraft carrier Charles de Gaulle for the first time.